And you know everything works. 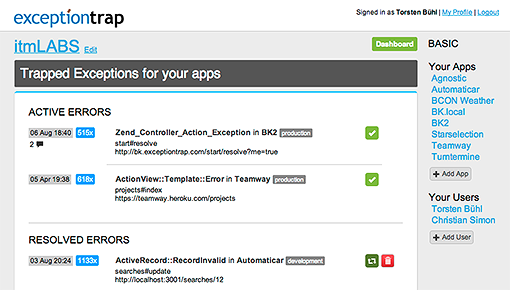 Start getting notified about all errors & exceptions in your app in real-time. Exceptiontrap collects the relevant information, groups similar errors together and lets you manage and fix them faster. Just install our gem for your Ruby on Rails application or include our PHP library. Once installed, all exceptions and errors thrown by your application are sent to our hosted service instead of occuring unnoticed by you. Incoming errors are intelligently grouped together and you get notified with all the relevant information – via email, Hipchat or Campfire. If an error occurs multiple times, we only send you one email instead of hundreds. With Notification Thresholds we can notify you if the same error occurs e.g. 10, 100, or 1000 times. Exceptiontrap has a nice and simple UI to manage the exceptions and errors sent by your applications. You can view, discuss, and mark the errors as resolved. Once an resolved error happens again, you are the first who knows about it. With Exceptiontrap you know that your app runs smoothly in production. Even the best tests can't give you this security. You see all the information related to an error at a glance. This lets you fix the error faster. In addition to emails, we can send error notifications directly to your team chat. So you can decide together how to proceed. Exceptiontrap makes it easy to handle your application errors in a team. At the dashboard, everyone sees what's going on and if there is something to do. You care about your data – we too. All data sent to our service is encrypted by SSL. Furthermore our servers and the company are located in Germany. You can trust us. Use our easy to use API to track errors from frameworks and languages for which we don't offer a plugin for at the moment. You should know when your app crashes – and why. Save time & money and track your app's errors with Exceptiontrap. There is also a DEV plan for $9/month (1 app, 1 user, SSL, rate-limit 10, 7 days data retention). Contact us for ENTERPRISE Plans or Exceptiontrap on your server.